Visiting Sydney? 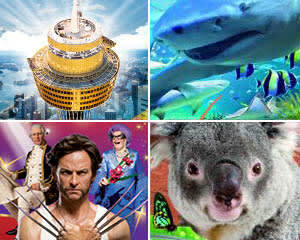 Ensure your time in Sydney is unforgettable with the great value Combo 4 Pass. Visit ALL FOUR of Sydney's top attractions once for one amazing price. Once you've entered your first attraction, you've got 30 days to visit the remaining 3 attractions on the pass, so you don't have to visit them all in one day! Note that you must book the date of your first visit with Adrenalin on 1300 791 793 - once you've entered your first attraction, you've got 30 days to visit the remaining 3 attractions on the pass, so you don't have to visit them all in one day! Selected purchase has not been taken yet so some questions are irrelevant at this time. Overall the experience was good!! enjoyed the sites visited. Though found other venues in sydney offered the same deal at similar cost. Easy to use and experience nil problems.